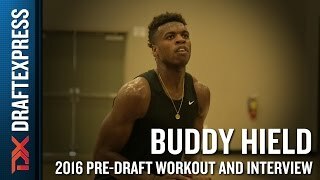 Hield improved in virtually every facet of the game between his junior and seniors seasons, going from a fringe NBA Draft pick to a likely lottery pick in the process. At 28 points per-40, with a 67% TS%, only Doug McDermott can boast having as prolific and efficient season as Hield has in the last 20 years of college basketball. Hield's perimeter shooting is as good of a place as any to start the conversation about his offensive game. His 147 3-pointers made (in 37 games) was by far the highest mark among all college players this year, and is tied for the highest total mark any college basketball player has achieved since Steph Curry made 162 back in 2008. What's impressive about Hield's 3-point shooting isn't just the huge volume of makes this season, it's also the incredible accuracy, at 46%. He's deadly in transition, is always moving to relocate into a better look after giving it up, and has a super quick trigger that allows him to get his shot off in the blink of an eye. Hield knocks down shots from NBA range on a regular basis, often with a hand in his face while well-guarded by defenses that are geared to slowing him down. Hield has always been a tremendous shooter (career 39% 3P%), but he was much more of a catch and shoot guy for the first few years of his college career. Although he's absolutely elite with his feet set still (68/139, 49%), he's also turned himself into a much improved off the dribble shooter as well (51/137, 37%), which makes him very difficult to stop considering many of these attempts come from beyond the 3-point line (0.98 PPP). Although he doesn't have great size, or the highest release point (he's largely a flat-footed shooter), he utilizes impressive footwork, hesitation moves and fadeaways to help him get his shot off in difficult situations, especially in big moments with the shot-clock running down. His ball-handling skills in general improved as his college career moved on, as evidenced by his career high 55% 2P% this past season. He's able to attack his defender off closeouts with nice footwork and timing, and will mix in some change of speeds, spin moves and side-steps out of pick and rolls and isolations. He drives left almost exclusively, but has started to show some ability to use it to finish inside the paint as well, where he shot 56% this season. There are some question marks about what type of creator he will be at an NBA level, though, as he at times struggles to turn the corner already against quicker collegiate guards, and can't always create much breathing room against bigger and lengthy wings. He can be a little bit predictable when putting the ball on the floor, as he almost always pulls up off the dribble or tries to execute a step back when driving left, and will try to get all the way to the rim when going right (which is rare). Not blessed with an elite first step, he can still stand to continue to improve his advanced ball-handling skills to create space in the half-court. In traffic, as he doesn't always have the size or explosiveness to finish effectively against rim-protectors, and thus relies very heavily on his shot-making prowess from the perimeter. Hield also doesn't offer much as a passer or facilitator, sporting the second lowest pure point rating and assist to turnover ratio among the shooting guards in our Top-100 prospect rankings. He'll pull off the occasionally drive and dish play, but for the most part he's looking for his own offense whenever he's on the floor, and does not possess an exceptionally high basketball IQ. The other pressing question surrounding Hield is his defense. While that was considered a clear weakness in the past, he's improved his effort level and fundamentals, and eliminated enough of the bad habits he had in this area that it's not as big a weakness as it may have been in the past. Still, he is undoubtedly undersized for a shooting guard at 6'4 ½ in shoes, which limits his versatility at the NBA level. While he played mostly the small forward position in college, his lack of size will make it difficult for him to cover many of the bigger wings he'll encounter, and he does not appear to possess great lateral quickness to stay in front of ultra-athletic guards. With that said, he has a reasonably strong frame, to go along with a long wingspan (measured at 6'8 ½) for a shooting guard, so even if he's strictly a one-position defender, there's no reason he can't at least be adequate there as he figures out that he absolutely has to in order to survive. With that in mind, Hield's overall intangibles make him the type of player who is difficult to write off, and to some degree, root for. He's one of the best rags to riches stories you'll find in the past few years, and is universally lauded for his work ethic, competitiveness and character. It's tough to envision a player who was as productive as he was at the college level not translating his effectiveness to the NBA, at least in some capacity. In that regard, there is a certain comfort level knowing what you're getting, which is, at worst, a tremendous shooter/scorer who plays extremely hard and will do everything in his power to be successful.